Are you a big fan of books-on-tape or Audible.com content? Do you have a long bus or train ride into work each day and want something else to do besides reading AvantGo channels? The Audible Advisor from Card Access lets the road warrior listen to audio recordings as well as store additional programs and data. The Audible Advisor, like other Card Access products, is a standard size Springboard module with 16 MB of memory. Using a special DSP chip, the Advisor can play any Audible.com content that is using codec 2 or higher. Audible currently has four different types of audio files that can be downloaded, but the Advisor, like many other playback devices, doesn't support Level 1, which has the most compression. I recommend using Level 2 because of its smaller size than levels 3 or 4. 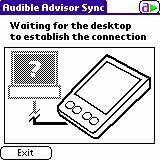 The Audible Advisor can also be used as memory storage for the Visor. Up to 16 MB of applications and data can be stored on the Advisor. The venerable FileMover application is used to move/copy files between the Visor and the Advisor. A set of earbuds is also included in the package. The Audible Player comes with an installation CD for Audible Manager, which unfortunately only works in Windows (Mac users can use the Advisor for storage only). If you are already an Audible user, the installation program asks you to download a small update that enables the Advisor to synchronize with your Windows computer. The module has on it a conversation with Robin Williams and George Lucas, but unfortunately Lucas doesn't apologize for Jar Jar Binks or offer any juicy information on Episode II. Installation was a little clunky but accepting the defaults moved me through it. For this review, I downloaded two books: STTNG: Q-in-Law by Peter David and The Second Coming of Steve Jobs by Alan Deutschman. Q-in-Law was an hour and thirty minutes, and The Second Coming of Steve Jobs was just under eight hours! Although you can listen to the Audible books on your computer, you're reading this review to find out about the Advisor. Transferring books to the Advisor is very easy. Insert the module into the Visor and place into a USB cradle. On the Visor, run the AASync application after running Audible Manager on the PC. Audible Manager will then establish a connection with the Visor. To transfer a recording from the PC to the Advisor, select the title and click the "Add to Audible Advisor" button. This isn't rocket science. Transferring a title doesn't take very long, and you can select how much content to send to the Advisor. For example, I was able to send all of Q-in-Law to the Advisor as well as two hours of ... Steve Jobs Even after transferring the titles, there was still 3 MB of space left on the Advisor that could be used for traditional data storage. Card Access claims that the Advisor can store a little over four hours of content, which should be enough for most bus or train rides, or non-transcontinental flights.